View our diamond solitaire rings here. When shopping for a diamond, you've no doubt heard references to the 4 C's of diamonds. Diamond carat is one of those popular ”C's” to consider when evaluating a diamond. It's a term used to describe how much the diamond weighs. A single diamond carat is equal to the weight of 200 milligrams or 0.2 grams. Diamonds are described two different ways in regards to the diamond carat. An abbreviation of “ct” is used to describe the weight of a single diamond stone while an abbreviation of “ct TW” is used when describing the total weight of an entire piece of jewelry - when it has more than one stone in place. It is important to recognize that two stones may have the exact same carats, meaning that they have the same weight measurement and yet they are completely different in size and appearance. This is due to the actual density of the gemstone. The more dense a stone is the more weight they have and sometimes a smaller stone will actually weigh more than a larger stone due to its density. 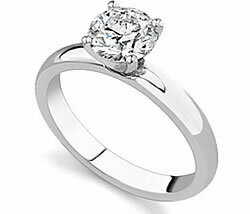 When selecting your diamond ring, you can choose between a single, diamond solitaire ring style setting (a single diamond on the ring) and a setting that has multiple, smaller stones to make up the ring. The value of a solitaire one diamond carat will actually be more than if you buy a ring that has two diamonds that add up to one carat or greater. Larger sized diamonds are more rarely found when mining diamonds, making them more valuable and expensive than purchasing the same amount of diamond carats in smaller stones. So, how do you determine what size diamond to buy? Do you want a diamond carat of 1, or 2, or do you want a ring with multiple, smaller stones? The answer to this will depend greatly on your budget, as well as the person who will be wearing the ring. A diamond will look larger on a slender finger; so, keep that in mind if the recipient of the ring has thin hands. The actual diamond carat measurement is probably not as much of a concern as the appearance, shape, and setting of the ring. Particularly because a 1 carat diamond ring will not look half the size of a 2 diamond carat ring, it's far more important to select a ring that is pleasing to look at than it is to buy one with the most carats you can afford. Determine how much money you have to spend and then decide on the cut of the diamond. Once you have these two pieces of information narrowed down, you can start browsing the diamonds in your price range in the style you want and find out what diamond carat you are in the market to buy.